Well, this episode was an interesting one. I don’t object to Abraham and Eugene being fleshed out as characters per se, however I think that it could have been handled better than it was in this episode. In order to feel the full weight of what Eugene’s revelation meant to Abraham we needed a more developed build up of Abraham’s past than we received the other night. Essentially we went into the episode knowing that the guy has anger management issues and is tough, and at the end of the episode all we have learnt is that those anger issues have lead to people being scared of him and that he lost his family a while back. Now all of those traits are fine, but the anger one feels too basically outlined for us to care when he looses it a few minutes later with Eugene, and the loss of his his family is far too simply handled at this point in The Walking Dead to really be that effective. Now, despite my somewhat negative opening tone I have to say that I did like this episode. I think it is easily the weakest from this season, but that doesn’t mean that it didn’t have it’s merits. The strongest thing to come out of this episode was perhaps the relationships between this group. The opening segment had a rather nice bit of interplay between the group which was both nicely handled and provided a bit of levity for once on this show. 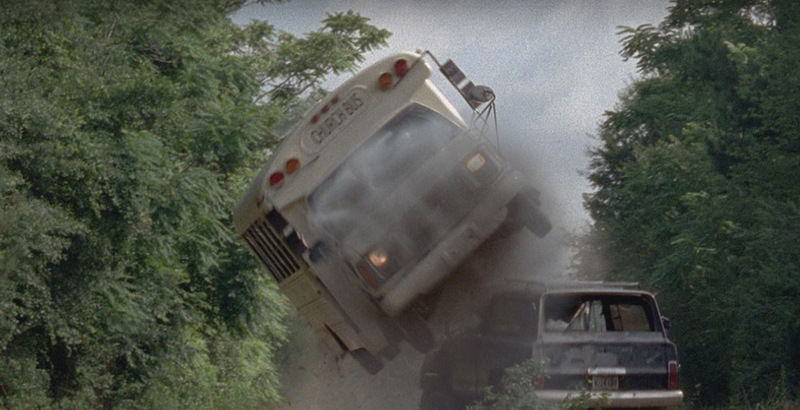 That actually continued pretty much throughout the episode with the relationships between characters being deepened (Glenn and Abraham) and some being announced pretty much out of the blue (Abraham and Rosita). The other really strong aspect to this show was Michael Cudlitz’s performance; he had to guide Abraham through a real range of states here and was impressive through all of them. My biggest problem really with this episode is that the reveal about Eugene is felt far more by the characters than the audience, many of whom (myself included) who suspected the truth a while ago. It’s a nice cliff-hanger to end the episode on, but I wish it had been set up in such a way for it to really hit us hard. This could have been another ‘We’re all infected!’ moment, but it unfortunately isn’t. That said I am so glad that Eugene’s secrets are lies because it was sounding like far too simplistic a solution and I really didn’t want the show to head in that direction. So that’s a plus. Also it’s nice to see that the show didn’t save it until the finale given that so many people saw it coming. I really like the bravery of this season, and I applaud the decision to focus these last two episodes purely on individual groups, rather than cutting around between them. The problem with this group, and I don’t know if you guys will agree with me, but I’m not really that invested in them. 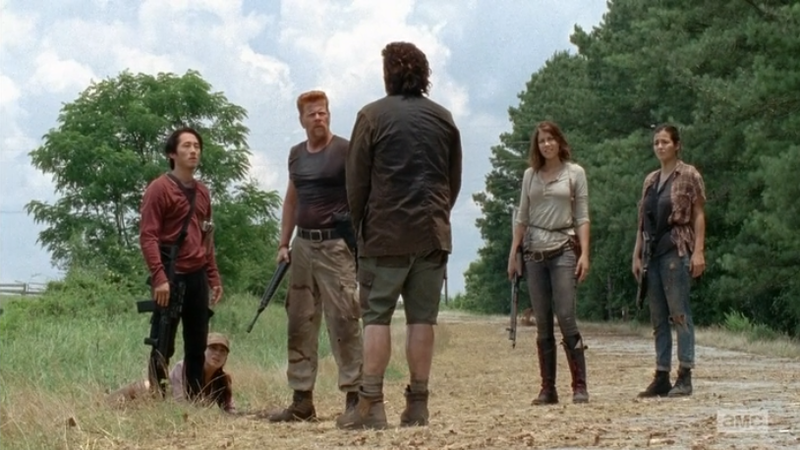 Abraham is interesting up to a point, primarily because he is hot headed and stirs up the group a bit, Eugene has been interesting but I don’t really care if he sticks around now… then we have Rosita who I like but who hasn’t really developed into anyone in particular yet. That leaves us with Tara, Glenn and Maggie. Tara is possibly the one who I am most attached to in this group right now. Glenn and Maggie… I’ve loved them in the show, but they have seen better days. They are becoming a little bit background at times, and will remain broken as characters in my eyes until somebody mentions Beth to them again. So the gang are without direction again, even if half of them don’t know it yet, and Beth is still trapped in the hospital. I’m actually really looking forward to next week to find out how exactly Carol and Daryl’s pursuit after Beth played out and to try and figure out if Carol is in trouble. I have a bad feeling about that…. Still, until then I shall leave you with the zombie kill of the week below. Please do comment in the box below, I want to hear your thoughts! Great review! I agree, this episode was probably one of the worst of the season and Abraham’s back-story didn’t add that much to his character. I also had a feeling Eugene was lying and now if he dies it won’t really phase me. The one moment that I felt was great was when Abraham first finds Eugene and he is being surrounded by zombies and Abraham helps him and in order to get Abraham to save him, Eugene tells him he is on a “mission.” If you watch Abraham he has this look of hope on his face and when you realize Eugene lied to him, it makes you feel for Abraham. His mission to D.C. was a mission of redemption and now that he knows it was all a lie, he has no idea what to do and has lost direction and hope again. Cheers! Yeah that was a good scene but imagine if we had known all of that a while back and this sense of redemption had been built up in us for ages – then we might have cared more when Eugene revealed his secret. Since when did you start doing TWD episode reviews? It’s a good one mind, though I felt as you mentioned the backstory elements were rushed, but also the reveal from Eugene. Now, I hate it when TV shows drag out a big secret for an entire series, but it felt to me like the reveal could have been done better. Or, they shouldn’t have made it SO obvious that Eugene was lying if they wanted to have a quick reveal like this, if I had believed he had a cure, the reveal at the end of the episode would have likely blown me away, but because I wasn’t it was very much a ‘meh’ moment. Glad all this is still doing well for you, by the way! Haha since the beginning of this season. Yeah I completely agree, this really wasn’t that well handled but at least it hasn’t been dragged out for too long. Cheers, thanks for stopping by! Hope you’re doing good? This group isn’t the best! Thanks for all of your comments tonight, much appreciated!